Please contact owner Lewis -- via Email: culler803@gmail.com - -- or Phone: 803-535-9925. Boat Location: Lake Murray, Leesville, South Carolina. 1982 Chris Craft Corinthian 38ft Cabin Cruiser. 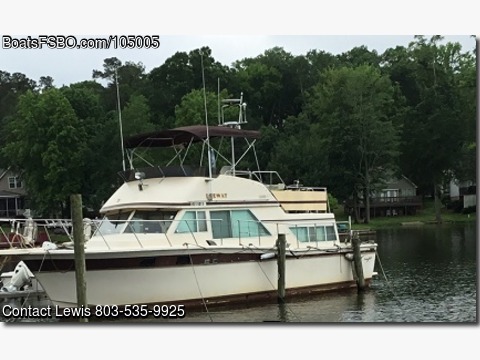 Twin 454 Crusader/GM 330HP Gas Engines Refurbished in 2009 including Electronic Ignition, 6.5KW Onan Genset, Depthfinder, VHF Radio, AM/FM/CD Stereo, Double Berth, Sleeps 6, 2 Heads, 2 Showers, Dual A/C & Heat, Full Galley with Refrigerator, Stove, Microwave, H&C Water, Removable Carpeting For Cleaning & Engine Access, Lots Of Storage, 4 Bilge Pumps, Coast Guard Package (Just Inspected), 2 Anchors, Windlass, Halon, Upper and Lower Drive Station, Fully Enclosed Upper Station, Hydraulic Steering, Swim Platform, Trim Tabs, 2 Rod Holders, Dockside Power, and Batteries. Great for Weekend or Live Aboard!